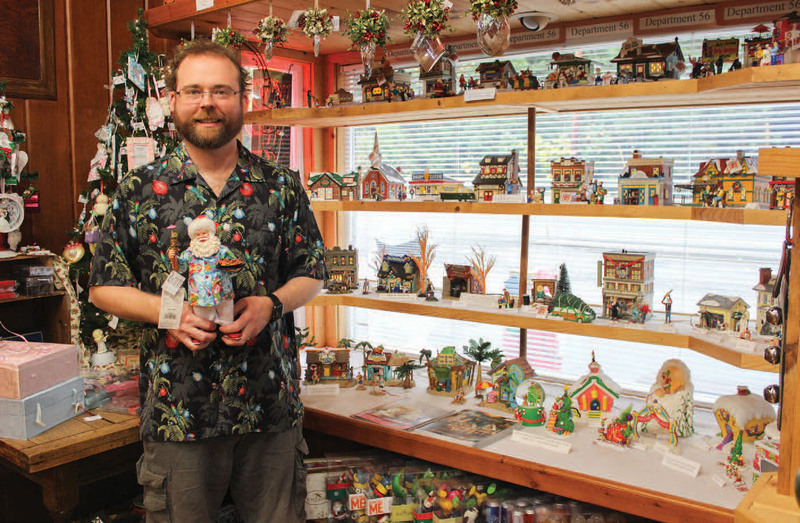 It’s Christmas year-round for Nancy Wood and Patrick Dibala, who own Christmas Treasures near Blue River along the McKenzie Highway. Drive east up the McKenzie Highway into the Cascade Mountains and you will find Christmas celebrated year-round. Sitting in the midst of the brown-barked, green-needled forest near Blue River is the red-dominated Christmas Treasures. It is a small building and business crammed full of Christmas decorations, creations and charm. People who come through the front door are greeted by the tinkling of Christmas bells. Visitors are usually in a cheerful mood when they leave and can’t wait for the Christmas season to put their new purchases on display. 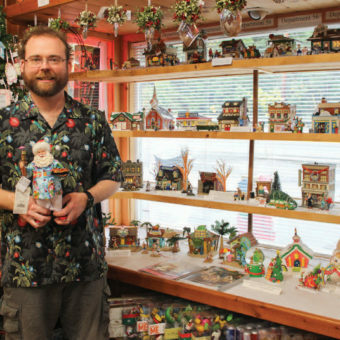 Christmas Treasures owners Patrick Dibala and Nancy Wood say there is satisfaction in putting smiles on people’s faces when they find a unique ornament or collectible that they just have to have. Merry Chilcutt of Bend admits the store regularly brightens up her days. She is a frequent visitor and has found many items to decorate her home during the Christmas season. Steve Dibala works in the store and helps select the inventory. 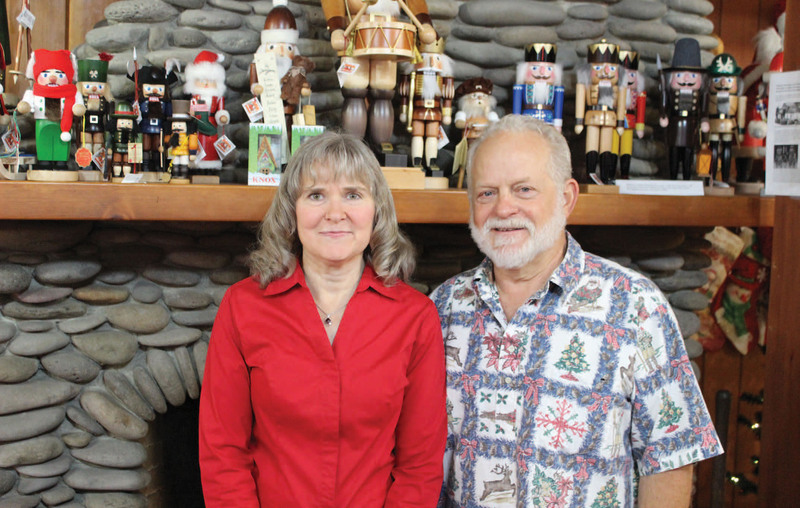 Patrick and Nancy have put together a business that features themed Christmas trees, shelves and displays. Those themes include Santa Claus, nativities, music, sports, animals, angels, babies, toys, nutcrackers, fishing and hunting. More modern themes include Star Wars and Marvel heroes. Those characters all have a Christmas look, whether they are holding a candy cane, a bag of presents or a Christmas tree. There is even a display of merchandise from “The Nightmare Before Christmas” movie. To have unique items, Patrick and Nancy and their adult sons Steve, Brian and Mark search far and wide via phone, the internet and in their travels. There have been years when Christmas Treasures features products from at least 30 different states and at least 30 different countries. In years past, Patrick and Nancy traveled to Christmas gift shows in New York City, Atlanta, Chicago, Seattle and Portland, and visited communities that are obsessed with Christmas year-round. Those include Leavenworth, Washington, a former thriving logging town that transformed itself with a Bavarian village theme and a nutcracker museum, and North Pole, Alaska. They have also made trips to Germany, visiting craft shops and factories where Christmas merchandise is created and made. Patrick, 64, and Nancy, 55, have eased back on their travels and workloads in recent years, turning more business responsibilities over to Steve and Brian, both full-time employees. 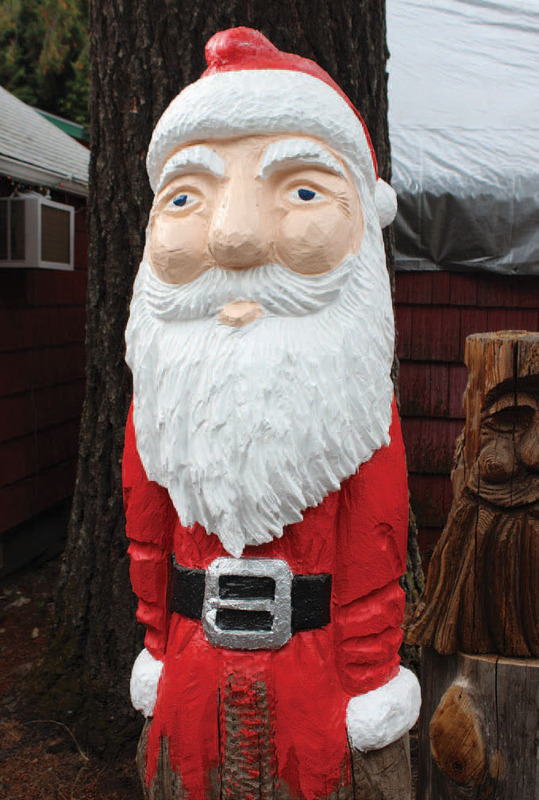 Outside the store are several painted chainsaw carvings of Christmas characters, ranging from Santa Claus to one of the three wise men. Patrick created the carvings. The wooden characters range in height from 3 feet to 12 feet. Patrick has also climbed a Douglas fir tree next to the store and wrapped it in Christmas lights. In 2003, he put about 50,000 LED bulbs on the 165-foot tree. At the time, according to his research, he claimed it was the tallest lighted tree. 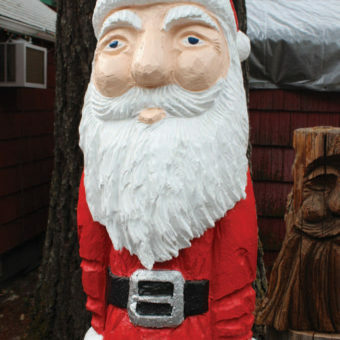 A chainsaw-carved Santa created by Patrick. The idea to create such a Christmas store and business came to Patrick and Nancy while traveling from their Florida home to New York to visit family. They drove the back roads and visited numerous shops and stores that featured unique custom made Christmas creations. Patrick owned a burglar and fire alarm company in Florida, and Nancy worked there. When they decided they wanted a change from a one-season location to one with three or four seasons, they looked west to Oregon. Patrick grew up in Reedsport and enjoyed outdoor recreational activities in the Cascade Mountains. The couple bought the old Blue McKenzie Lodge in 1992. After a year of renovation with help from Patrick’s brother, Dan, Christmas Treasures opened in 1993. In those first years, most of the store’s business was done with visitors walking through the front door. “Business shot right up after Steve created our website,” Nancy says. The family closes Christmas Treasures for three or four days around Christmas day, but they open the doors shortly afterward and the yearlong Christmas season begins for them again.